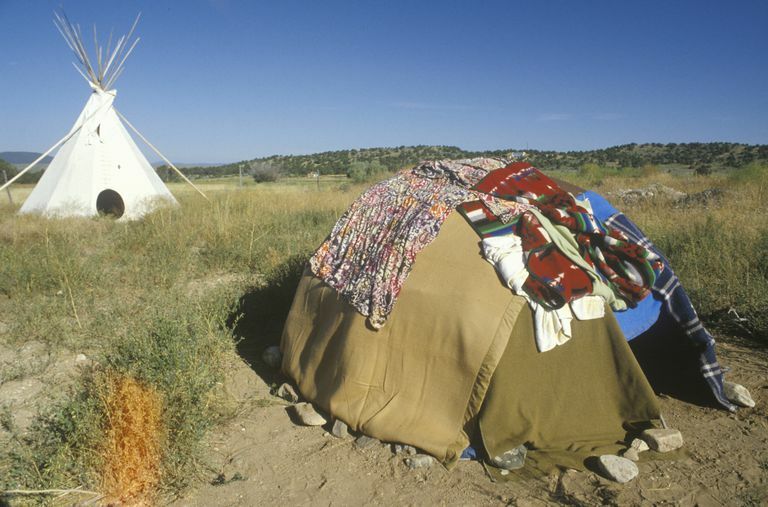 Each sweat lodge experience stands alone, unique from previous or future sessions. so, it is best to keep your expectations in check. Prior to agreeing to participate in a sweat it is good learn if there is a specific purpose or intention in place. Familiarize yourself with any rules and ask what will be expected of you before, during, and after the sweat. You might be asked to fast or refrain from consuming caffeine and/or alcohol for 24 hours before the sweat. Also, some sweats are clothing optional, knowing this means there will be no surprises. Basically, the host or lodge leader serves as the master of ceremonies and the sweat participants follow his instructions throughout the sweat proceedings. In May of 1997 the members of the meditation group I belonged to was invited to participate in a ceremonial sweat. This particular sweat was intentioned to be in Gratitude to our Earth Mother, Gaia and a celebration of the Spring season. This intention was appropriate with Mother's Day approaching on the week-end. This purification ritual was held to honor our Earth Mother as well as all our blood-lineage mothers and grandmothers, including past and future generations. Bill Dopke, our host and guide, recommended that all the sweat participants eat a light breakfast, but to skip lunch and supper on the day of the sweat. The sweat was scheduled to begin around 8pm. About two hours prior to the sweat ceremony I realized that my body required some nourishment so I allowed myself a plain roll and a handful of grapes rather than fasting. My anticipation was high. I was excited about getting to experience my very first sweat. The group of us walked the short trail from Bill's river home entering the timberlands on his property in Illinois. In silence we made passageway to the Native American styled ceremonial lodge he had built with his own hands. We came to a clearing of trees with wooden stakes marking North, South, East, and West. Each marker had a ceramic mask nailed to the stakes. These masks were artworks of our host, a sculptor. In the center of the clearing a burning fire greeted us with its warmth, as did the wind, and the swaying tree branches above our heads. We each tossed a pinch of tobacco into the fire as an offering to show gratitude to Gaia. Taking turns, we each rang a bell to invite the forest sprites to join us in our celebration. We gave oral blessings to our mothers, our grandmothers, and our great-grandmothers. We took turns smudging each other's auras with the smoke from a smoldering mountain sage wand, breathing in its woodsy and sagey fragrance into our lungs. We each were given a twig of fresh sage to grasp inside our palms as we prepared to enter the lodge. We each took a curious peek inside the lodge. In the center of the lodge we saw where the earth had been scooped out to make room for the heated river rocks. Earlier in the day Bill had gathered rocks from the waters of the Mississippi River and placed them under the fire he had set ablaze. Bill now gathered the red-hot rocks from beneath the fire and carefully carried them one-by-one by shovel through the doorway of the lodge, dropping them into the center pit. Seven of us crawled into the small man-built dome-shaped shelter. Others remained outside of the lodge to watch over the fire and make themselves available if anyone needed assistance during or after the sweat. I sat cross-legged with my head and shoulders hunched over slightly since the ceiling of the lodge was very low. My discomfort was immediate. I wondered if I would be able to endure the full forty or more minutes that the ceremony would last. I sure hoped so. I was seated smack in the middle of the lodge. The only way I would be able to get out was to ask three other people to crawl out of the lodge ahead of me to make a passageway for me to exit. Each ladleful of water poured upon the heated rocks brought forth increased bursts of heat and steam into the air. I placed the fresh sage sprig, which was quickly wilting inside the palm of my hand, under my nose. Breathing deeply into my nostrils, I became incensed with the basic four elements: Air, Earth, Fire and Water. My discomfort was becoming more apparent, but eventually forgotten as breathing deeply became my only focus. I was no longer my body, only my breath. My body swayed slightly from side to side and I found myself humming quietly as I listened to the sound of the wind outside of the lodge. Two bodies bolted from the lodge, unable to complete the process. This allowed the rest of us to stretch out a bit. We were half-way through the ceremony, the heat intensifying each minute. One by one, we each invited the Native American medicine wheel spirit animals to communicate with us. Our host asked that we each request anchors to be pulled up from the earth. Anchors, meaning our issues, our blocks, our difficulties. Everyone in turn made their verbal requests. When it was my turn I asked that "feelings of sadness" be pulled up and replaced with "feelings of joy." We gave our final gratitude statements. Bill opened the flap of the lodge, inviting us to make our exits. As I dragged my sweat-drenched body out into the night air, I wandered into the dark woods, sat upon the ground and propped my body against a tree trunk. I thanked this tree for its support. I looked to the night skies above which were filled with bright stars and a crescent moon. My heart beat rapidly. The wind upon my face brought feelings of joy.